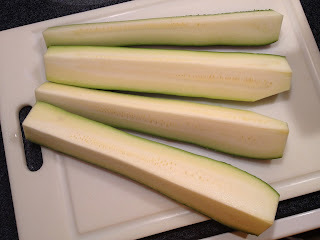 The zucchini in my garden is going CRAZY! The picture below is probably only about 1/8 of what my garden has produced….so far. 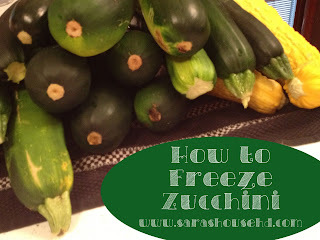 I’ve tried a few different recipes, but two people and a three year old can only eat so much zucchini (and I’ve even given a lot away to family), so I thought I’d freeze some for later use. 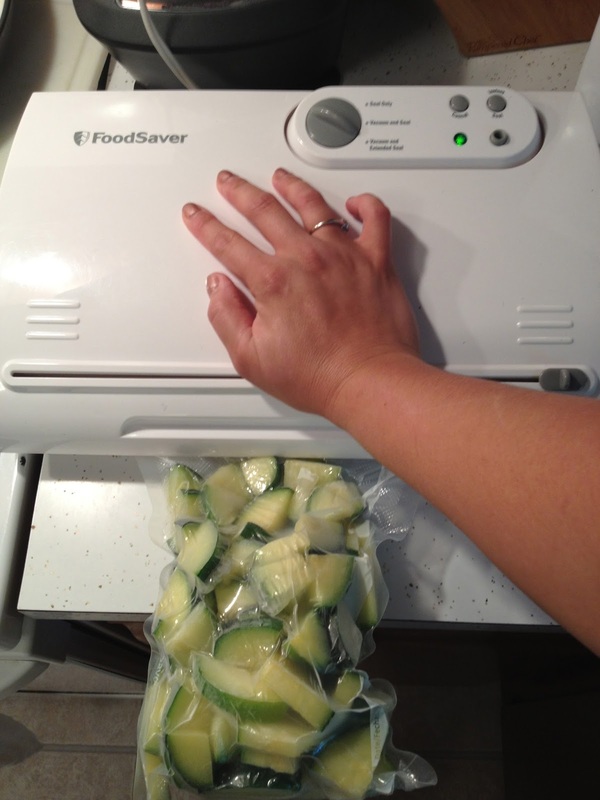 I did some reading online and this is what I’ve come up with on how to freeze zucchini two different ways. First way is in chunks and the second way is shredded. 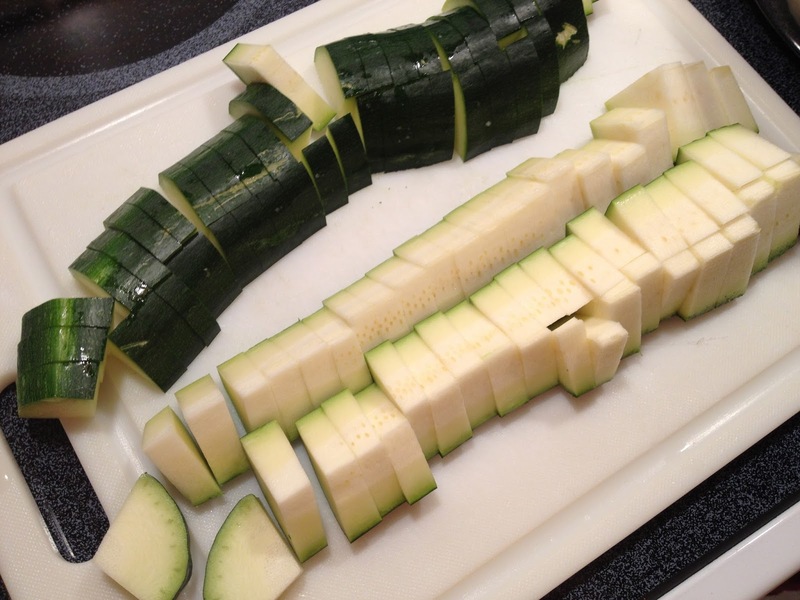 Start by washing your zucchini and cutting off both ends. Then, depending on how big your zucchini are, you’ll need to at least quarter them. Next slice them into bite-sized pieces. 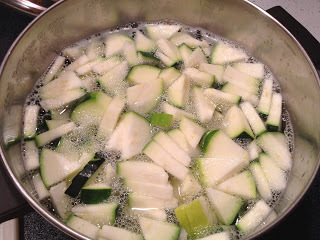 While cutting up the zucchini, bring a large pot of water to a boil. 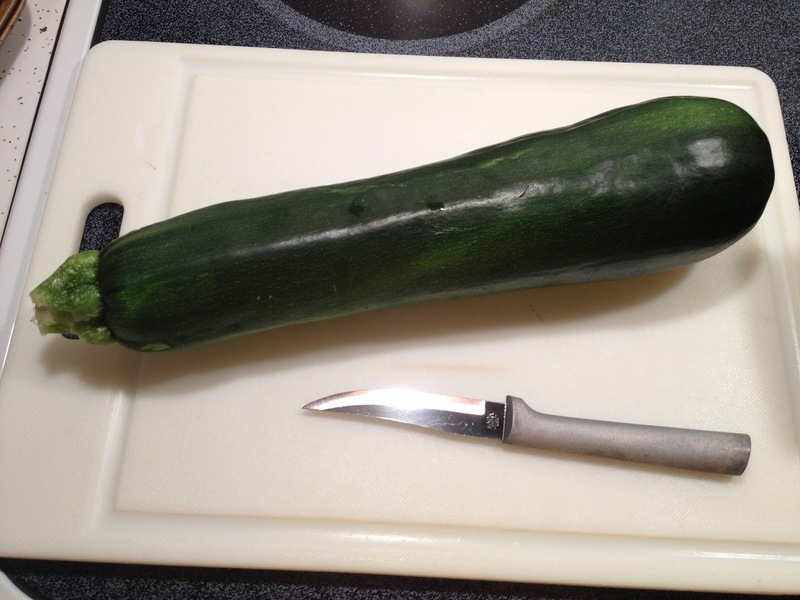 After the minute is up, place the zucchini into either a large bowl of cold water or in my case a sink of cold water. You want to stop the cooking process. 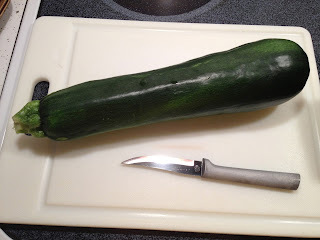 Since I was doing so many zucchini, one side of my sink worked the best. I filled it up with cold water and after adding a few more batches of zucchini, I just drained it and refilled it with more cold water. 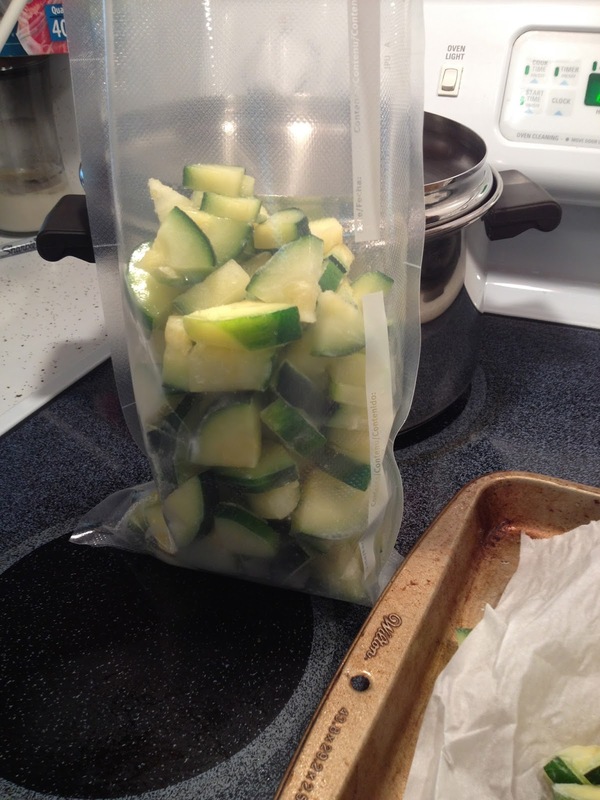 After the zucchini has completely cooled, drain the water completely. 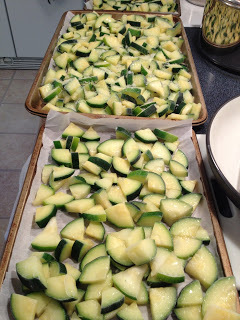 Then place the zucchini on parchment paper lined metal pans. Next place the pans in the freezer until completely frozen. This will take a few hours at least. 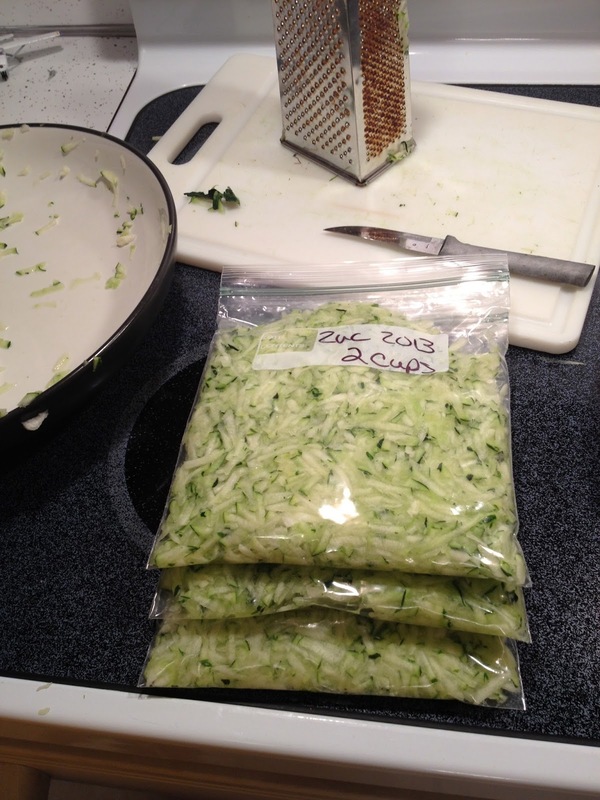 Once they are frozen, break the pieces apart and place into a freezer bag. I used our FoodSaver to vacuum seal the zucchini. Once the bags are all sealed, make sure you write what it is and the date on the packages. Then put them in the freezer for later use! 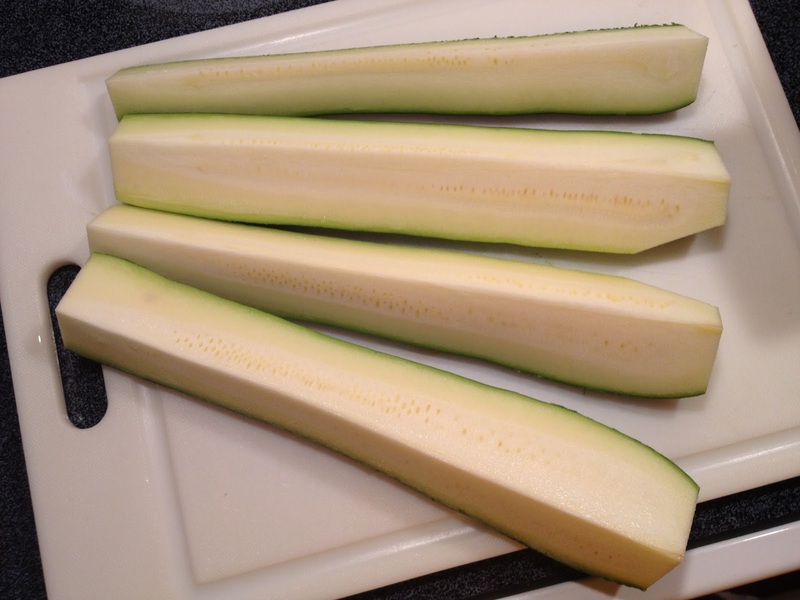 Some ideas are Easy Cheesy Zucchini Bake, Garlic Roasted Zucchini, Tortellini and Zucchini Soup, Sesame Chicken and Zucchini Stir-fry and many more! This is the easiest way to use up zucchini. 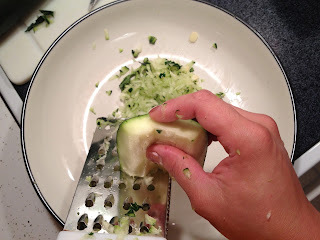 All you do is shred the zucchini up (I don’t even peel mine!). 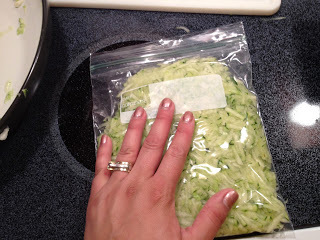 Then place desired amounts in freezer bags. I measured out two cups for each freezer baggie. Then I flattened the bags of zucchini so they would be easier to stack in the deep freeze. Again make sure to label them! 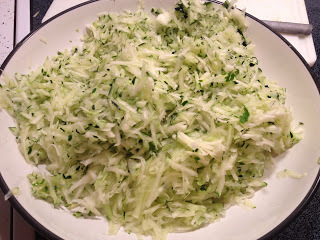 You can use shredded zucchini in all kinds of recipes, like Zucchini Cake with Cream Cheese Frosting, Chocolate Zucchini Bread, Zucchini Au Gratin, Zucchini Green Chili Cornbread, Cheesy Zucchini Rice and many others!